The purpose of the ExPats in Vallarta group is informal fellowship and assistance for expats living in, or visiting, Puerto Vallarta and the greater Banderas Bay region - or those considering moving to the area. Puerto Vallarta, Jalisco, Mexico - ExPats in Vallarta, a fun and friendly group of Puerto Vallarta residents and visitors from other countries, has announced this month's schedule of happy hours and events. Dinners are scheduled for Thursday, April 11th at Tino's Laguna in Nuevo Vallarta and on Thursday, April 25th at Las Adelitas in Fluvial. Advance reservations and purchased tickets for the dinners are necessary. A Wine and Appetizer Evening will be held on Wednesday, March 24th in the downtown area. Advance reservations are necessary. Also, on May 9th, ExPats will be having another Day Boat Cruise and tickets are now available since it will likely sell out early again. To make reservations for the Happy Hours, the Dinners, Day Boat Cruise and Wine and Appetizer Evenings, email sarawise45(at)gmail.com. The local group of Expats In Vallarta is open to all residents, visitors and investors from other countries. 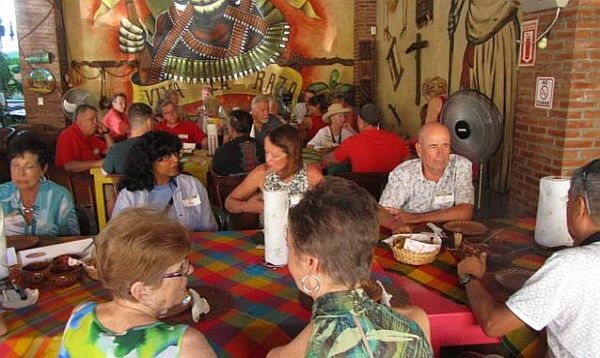 The purpose of the group is informal fellowship and assistance for ExPats around Vallarta or those considering living in the area. There is no membership fee or requirement; everyone pays for only what they use or consume. It's a great way to meet new friends and get out and enjoy Puerto Vallarta. For more information, to join the group, or for insight on what others have experienced during their move to Puerto Vallarta, visit ExpatsInVallarta.com.